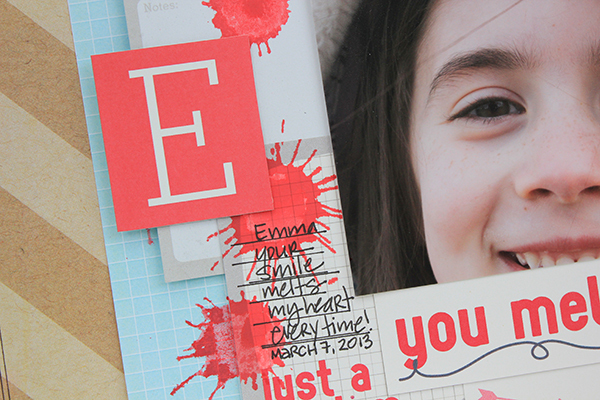 Today is Elle's Studio January Kit and January Inspiration Gallery reveal. I am thrilled to be a part of each of these with several new scrapbook layouts that I have created. You can see all of my layouts, as well as inspiring projects by the rest of the Design Team, in the Inspiration Gallery. The layout I am sharing today was created using the January Kit, Digital Cut File and patterned paper from the Penelope collection. I loved selecting bits and pieces from the kit and coordinating them with papers from this collection. A fun tip I have to share with you is that the larger blue piece of "paper" on the left hand side is the packaging from the kit. When I was creating the layout, I felt like it needed another piece of blue to help balance the placement of the blue die cuts. 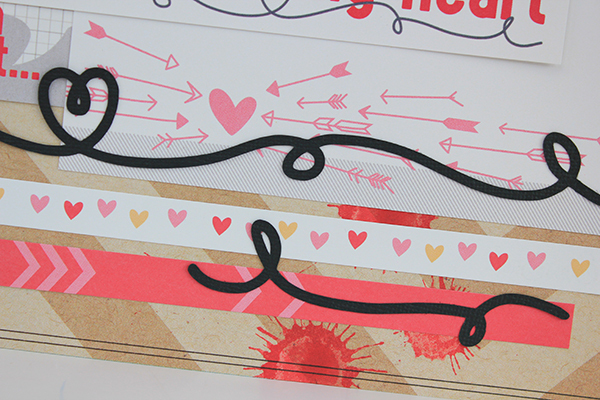 I also love using the printed strips at the bottom of each of the patterned papers. 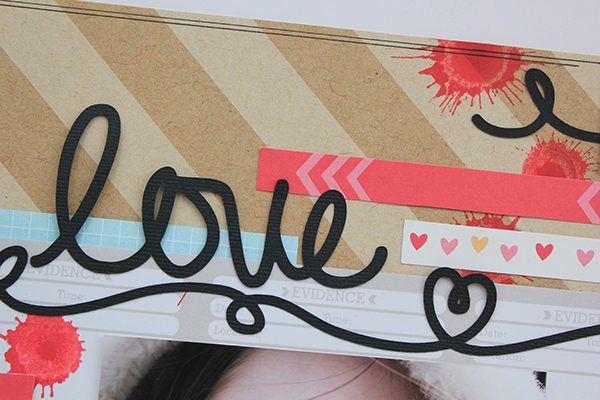 I combined and layered these with the Heart Doodle and Love cut files. You might remember a layout I did back a few months ago using the Distress Stain Ink Splatter technique. Well, I used it again here, but with a different color - red. It is so much fun to smash that bottle onto the paper and watch it splatter! This kit was so much fun to create with. 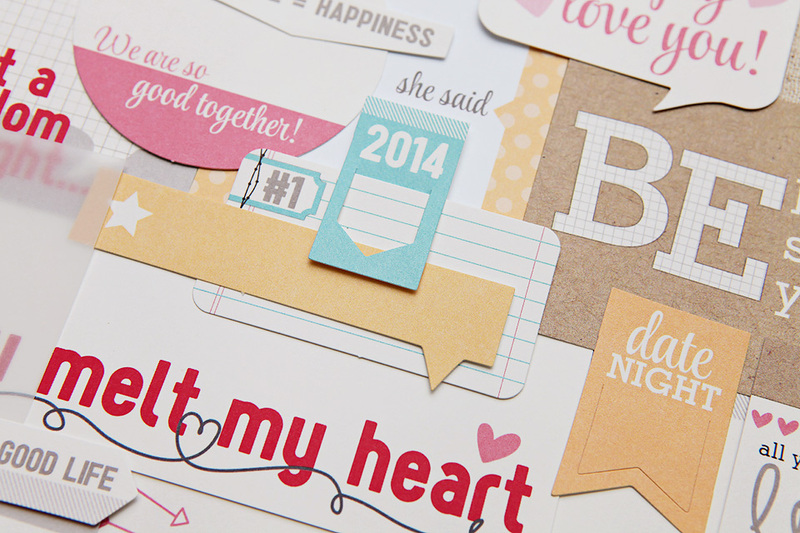 It has a great variety of shapes and sentiments that are perfect for all kinds of projects. You can purchase the January Kit for $9.99 until midnight as part of their launch day special. Along with the kit, you can also purchase a coordinating January Digital Cut File, which I used on the layout I have shared below. Something new, starting this month, is a coordinating January Stamp Set. How fun is that? Now, head on over to the Elle's Studio Shop to purchase all of these new goodies. What a fun layout! Your such a brave girl doing those ink splatters! Looks like you had tons of fun with this kit. Have a fabulous weekend! LOVE it Juliana!! Great use of the kit and I love those fun splatters!! I use the Elle's packaging a lot too! It's great when the packaging is just as cute as the products!! This is gorgeous!! LOVING the colors, the splatters and loving how you used the packaging!!!! Absolutely gorgeous layout, Juliana! Such a fun kit, and I love what you did with it. Your idea to use the recycled packaging was fabulous, as that bit of extra blue really, really works. Totally LOVE the fun paint splatters, too, and I love the pop of black. The paper strips from the bottom edge are a fabulous finishing touch!